Last week saw the magnificent new 443-foot 150-berth river cruiser S.S. Maria Theresa sailing on her maiden voyage through the waterways and canals of the Benelux before entering service between Amsterdam and Budapest for the summer. We have a look at some aspects of this vessel and her owners, Uniworld Boutique River Cruises of Los Angeles. Meanwhile, in another part of the world, Quark Expeditions has announced that the 102-berth expedition icebreaker Kapitan Khlebnikov will be returning to revenue passenger service in 2016, with a 75-day complete circumnavigation of the Arctic Ocean that can also be booked as for separate itineraries. Last week saw the entry into service of one of Europe’s most luxurious river cruisers, the S.S. Maria Theresa, by a company called Uniworld. The S.S. in this case stands for Super Ship. The S.S. Maria Theresa left Amsterdam on March 28 on her maiden voyage, a “Tulips and Daffodils” cruise through the Netherlands and Belgium and finishing in Antwerp this week. Who are Uniworld, one might ask, even if today the company operates a fleet of fourteen of Europe’s best river cruisers, where old world luxury meets modern convenience. Ten of this fleet were built in the present century. Based in Los Angeles, Uniworld was founded in 1976 by Serbian-born travel entrepreneur Serba Ilich, but did not begin offering river cruises in Europe until 1994. Its passengers have typically come from the English-speaking world, and largely until recent years from North America, where it is best known. In 2004, Uniworld was purchased by the Travel Corporation, founded by South African-born Stanley Tollman. The Travel Corporation’s portfolio includes operators such as Trafalgar Tours, Insight Vacations, Contiki Tours, Brendan Tours and Red Carnation Hotels, most of whose properties are in Europe. Starting last year, Uniworld’s river operations became all-inclusive, with drinks, shore excursions, airport transfer and gratuities all included in the basic fare. Uniworld entered the European English-speaking market by forming an association with Titan Tours, now part of Saga, in the UK. Last November, however, it opened its own UK office under Kathryn Beadle, who formerly headed up Hurtigruten UK, and reports directly to Uniworld president and ceo Guy Young in Los Angeles. In this regard, Uniworld followed Connecticut-based Tauck Tours, which opened its own UK office earlier in the year. The 150-berth S.S. Maria Theresa was christened by Princess Anita von Hohenberg, a direct descendant of the vessel’s namesake, the Archduchess of Austria and Queen of Hungary and Croatia. Maria Theresa ruled the Habsburg Empire from 1740 to 1780. The new vessel was built by the Dutch shipyard of Gierlien van Tiem that also produced the S.S. Antoinette (2011) and S.S. Catherine (2014), each ship being completed with its own very distinctive décor. The christening ceremony took place in Amsterdam and was attended by Uniworld president Guy Young and the Tollman family. The design of these vessels was overseen by Beatrice Tollman, president and founder of Uniworld’s sister company, the Red Carnation Hotel Collection; her daughter Toni Tollman; and Brian Brennan, projects director for Red Carnation. The S.S. Maria Theresa’s décor is inspired by the Baroque period. There are antique mirrors throughout, gold leaf details and custom furniture pieces from around the world. The ship’s lobby is dominated by a 10-foot oil painting of Maria Theresa. The vessel includes the line’s usual comfortable and plush public areas and has 64 staterooms measuring between 162 and 194 sq ft, ten suites of 305 sq ft and one Royal Suite of 410 sq ft. The S.S. Maria Theresa will sail Uniworld’s “European Jewels” itinerary from Budapest to Amsterdam, as well as other European itineraries at different times of the year. The S.S. Catherine, christened by Catherine Deneuve last year, sails France’s Burgundy and Provence regions along the Rhone and Saone rivers, while the S.S. Antoinette plies the Rhine. Uniworld is the world’s only boutique cruise line, featuring luxurious ships with an average capacity of 130 guests and the highest staff-to-guest ratio in the river cruise industry. As well as Europe, it offers voyages in Russia, China, Vietnam & Cambodia, India, and Egypt on a total of twenty-two rivers worldwide. Quark Expeditions, part of the TUI Group, has announced that it will be recommissioning the Russian icebreaker Kapitan Khlebnikov to offer a complete circumnavigation of the Arctic Ocean in 2016. 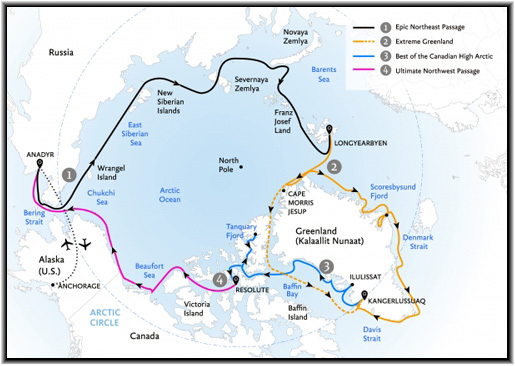 Quark passengers will be the first travelers in the world to be able to combine four different voyages into an epic circumnavigation of the Arctic through the fabled routes of he Northwest and Northeast Passages, Greenland, and the Canadian High Arctic. The Kapitan Khlebnikov was renowned as an expedition ship between 1992 and 2012, during which time, in 1996, it tied Norwegian explorer Roald Amundsen’s record for reaching 78° South. Later that same season, the Khlebnikov became the first ship to circumnavigate Antarctica with passengers and it remains the only passenger vessel on the planet to have circumnavigated Antarctica twice. A full icebreaker, Khlebnikov was purpose-built in Finland in 1981 for crushing through strong sea ice. Nine years later, she was refitted as a passenger expedition ship. As a result of low world oil prices, the demand for her in the Russian Arctic has apparently diminished to the point where she can now once again be made available for expedition voyages with paying passengers. As refitted, the ship now features complimentary alcoholic and non-alcoholic drinks, 51 cabins, a dining room, lounge and bar, heated indoor plunge pool, sauna, lecture auditorium and when she returns in 2016, a Polar Boutique. The Kapitan Khlebnikov is also the only passenger vessel featuring two on-board helicopters, providing frequent opportunities for remarkable aerial sightseeing few passengers in the world are likely to experience in their lifetime. 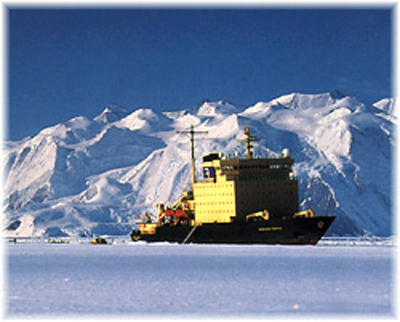 In 1992, Khlebnikov joined the Quark Expeditions fleet and served as its flagship icebreaker until 2012, enabling such feats as carrying the first commercial passengers to the Dry Valleys in Antarctica’s Ross Sea sector. * Epic Northeast Passage (25 days) – July 10, 2016 – Anadyr to Longyearbyen, through what the Russians call the Northern Sea Route. * Extreme Greenland Expedition (21 days) – August 4, 2016 – Longyearbyen to Kangerlussuaq. * Best of the Canadian High Arctic (18 days) – August 22, 2016 – Kangerlussuaq to Resolute. * The Ultimate Northwest Passage (18 days) – September 6, 2016 – Resolute to Anadyr, from Arctic Canada to the Russian Far East. * The four voyages can be combined into a unique and epic 75-day tour of the Arctic Ocean. Designed to withstand the harsh Siberian ice conditions, Kapitan Khlebnikov can depart early in the season, cutting pack ice through the Northeast and Northwest Passages. She already has the distinction of having transited the waters of the Northwest Passage seventeen times east to west or west to east, more than any other passenger ship.